recipe – IS HAPPINESS SPOON FED? It is foreign to me, and my husband and we are really struggling with how to make this work for us. You would think this would be easy, like a kindergartener learning to eat, but when you have eaten a certain way all your life… This isn’t an excuse, it is my struggle. I know the right way to eat, but my autopilot is the wrong way. So we struggle everyday with rewiring out autopilot. We are trying, and this recipe is going into the arsenal. I don’t like onions and this recipe calls for scallions. We only used half what it calls for but I upped the garlic. I love garlic. However, scallions are very subtle that we might up it back up to 6 next time. This is a lot of chopping so I think next time we are going to chop up some of it the night before because it is a bit much for the morning. It is a delicious recipe, even if it looks a little like goop. It says to tear your tortillas into little strips and put them in the skillet. However, we ate it like actual tacos, or tostadas. We piled on all the stuff on top…yum. I just copied this from the web site for Prevention magazine. Preheat the oven to 350°F. Stack the tortillas on a large piece of foil, sprinkle the top one with water, and wrap in the foil. Heat for 10 minutes. Meanwhile, heat a large nonstick skillet coated with olive oil cooking spray over medium-high heat. Add the scallions and bell pepper and cook for 5 minutes or until lightly browned. 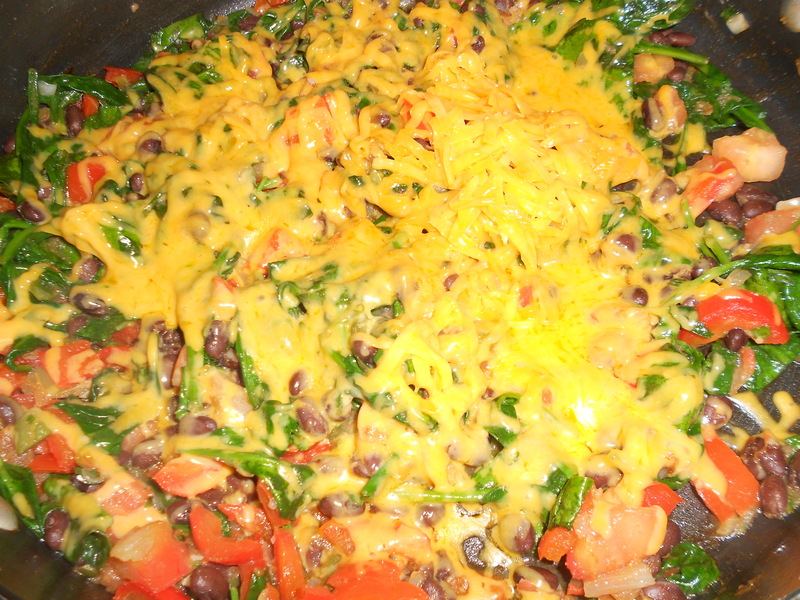 Add the jalapeno chile pepper (if using), garlic, and cumin. Cook for 2 minutes or until lightly browned. 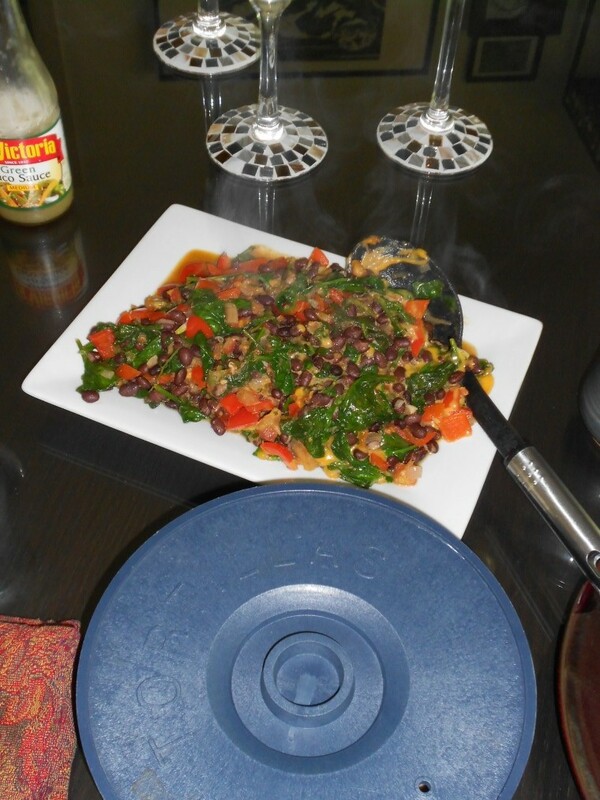 Stir in the beans, spinach, and tomato. Cook for 2 minutes or until heated through. Spread the mixture evenly in the skillet. Remove from the heat and sprinkle with the cheese. Let stand until melted. Top with dollops of the sour cream and sprinkle with the cilantro. Cut the warmed tortillas into quarters or strips. Serve immediately with the taco skillet. My friend Shellie gave me a recipe, which I am calling Popeye Shakes! 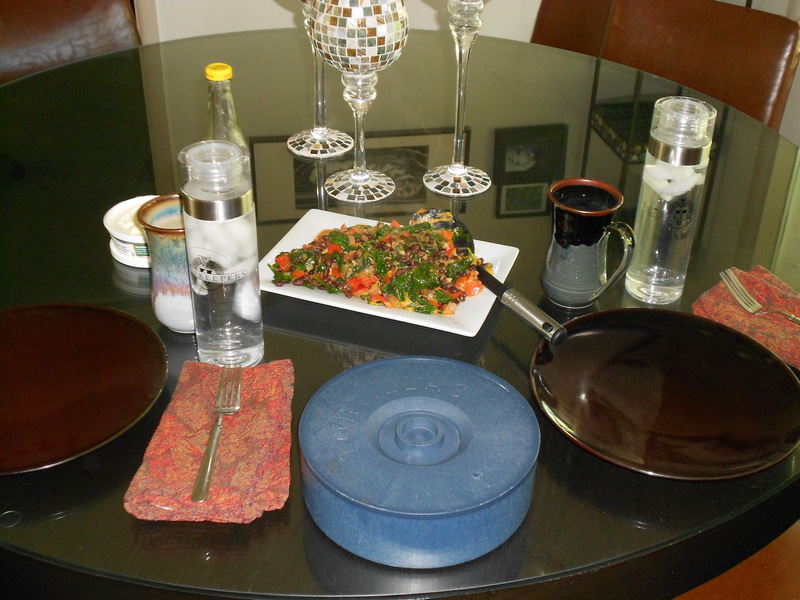 Shellie is a Vegan, so I think my husband was distrustful of any recipe that she gave us. It is like we picture Shellie over there only eating celery and twigs and dry granola. He really grumbled about the idea that we were going to put spinach in the blender. I think the misconception we both had was that nonmeat eaters must not like good tasting food. It is a misconception; I think a lot of people have. Sorry Shellie, but it is true. I think that we also have prejudice of green food in a cup. I mean first you have to get into green veggies in general. You have to realize that Brussels sprouts, spinach, and zucchini are good and yummy when you cook them right. I think you have to go there before you can take the leap to green liquids. So here we were with this recipe that puts a whole bunch of spinach in a blender. I ignored Brad’s grumbles and made it anyways because we have a really hard time getting enough greens in our diet. I am desperate to get those vitamins because I need my iron. 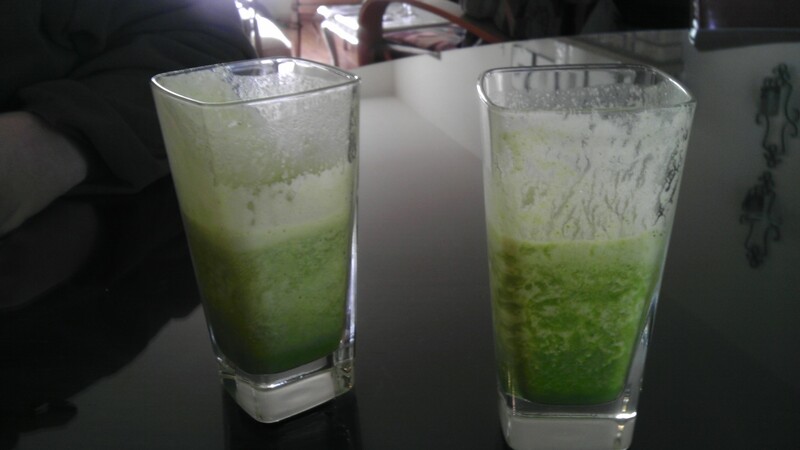 Shellie calls it the Green Smoothie, I like Popeye Shake. She says you can use a ripe sliced pear instead of a banana if you want. I froze my bananas because they were getting really ripe, on the verge of going bad. Here is a tip, freeze it after you peel it…otherwise it is unbelievably hard to get the peel off. Well Shellie, you are allowed to recommend anything to eat anytime. We loved these smoothies, and vegans do love good food. I am here to blow that misconception out of the water. What this smoothie does is make spinach taste pretty much like a frothy honey flavored banana. Brad was super surprised he really loved it. It makes the perfect amount, enough for two large drinks or four small drinks. I am going to need to get a new blender; mine is from 95 and lived through the frozen drinks of my twenties, so when I blended this shake you could smell the burning rubber. The recipe is too big to put in my magic bullet though. I know that we are still getting a lot of the nutrients because there were little flecks of spinach throughout when the ice was all blended. I read in Women’s Health that you don’t want to blend or food processes it too much because then there goes all the fiber. So this recipe is a definite success! Thank you Shellie for not only a good healthy recipe that will sustain me but also that you have blown away some of our preconceived notions.